Reporting is important to your business. SPOT has over 165 reports for you to review. While you will probably not need all of these reports, the wide range of choices ensures you'll have the ones that are right for your business. The concept of running work-in-progress reports is now an obsolete notion with SPOT's new real-time "Alerts" and "Advanced Searches." This powerful feature notifies you immediately if you have a problem in production without the need to print a single piece of paper. Reports are only two keystrokes away from our home page and access is controlled with password security. Reports can be viewed/grouped by category in our "Quick Reports" for your day-to-day needs or from the "Reports Gallery" which breaks the reports down into 19 separate groups for easy access and management. These groups include Customer, A/R, Adjustments, Production, Time Clock, Sales, Management and others. Incoming Summary - Incoming sales are broken down by store/route/counter or they can be consolidated in one easy to read report. The report shows sales, adjustment, average piece price per department, upcharge percentages, number of orders, average order price along with many other key numbers. Incoming Detail - Incoming sales are broken down by store/route/counter or they can be consolidated and show full details of each transaction. Outgoing Summary - Outgoing sales are broken down by store/route/counter or can they be consolidated in one easy to read report. The report shows sales by tender type and adjustments. Adjustments - Coupons, Adjustments, Voids and Discount reports are available and can be sorted by customer, clerk, date and type. Customer - Customer reports include new customers, call backs required, duplicate customers, Heat Seal Customers, Inactive customers, Lost Tuna Customers, Referrals, Status, We Miss You, Top 20, Top 50 and Top Percentage of customers. Management - Manage the day-to-day employee lists, cash drawer detail, transaction details, pay-ins and payouts, and others with management reports. Marketing - Details by department, Lost customers, New customers, Marketing summary, Out of Pattern customers using visit frequency, Out of Pattern customers using marketing category usage. Production - Current orders, Alterations, Drop-offs by clerk, Drop-offs by hour, Drop-offs by department, Employee production, Item counts by clerk, Order aging, Inventory aging, Redo's, Upcharge summary. Restoration - SPOT contains many unique features designed to meet the specific needs of the restoration cleaning business. Manifests can be printed that contain both summary and detail information for Contractor's billing, Insurance billing, Customer's billing, or by delivery room or orders by location in the facility. Billing statements are sent to the Agency/Agent rather than the restoration customer. Time Clock - Collect and report on hours worked by company, store, employee or department, with automatic calculations of overtime hours for a given pay period. Real time access to current users and time clock status is always available. Work In Process - Overdue inventory 30+ days, Overdue inventory 60+ days, Overdue inventory 90+ days, Inventory reports, Current orders, PNP orders. The most powerful reporting tool available in the industry. 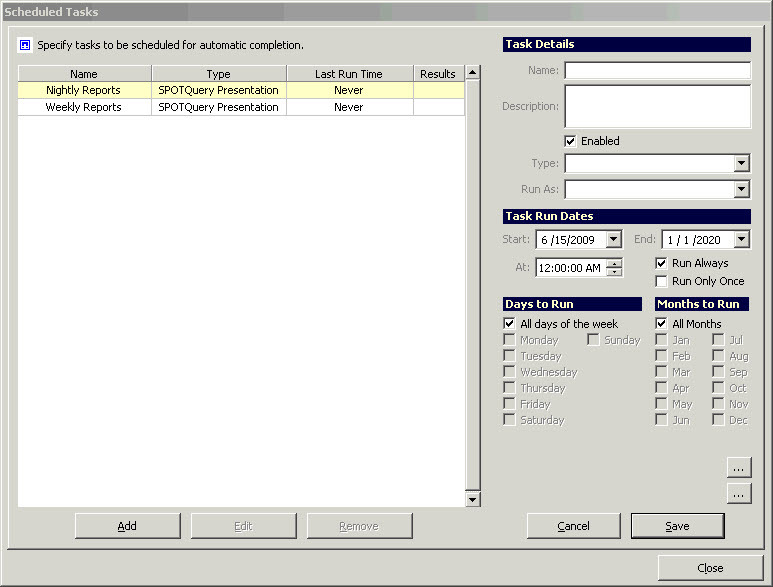 SPOT Query will allow you to use our "SPOT Query Builder" to assist you in building reports. For those who like to use SQL you can use native "SQL Statements" to gather a record set, then use SPOT Query to build the presentation layout. This eliminates the need to understand third-party reporting tools and gives you maximum control over your reporting needs. Report Queue saves you and your staff time and paper when generating reports. The report queue allows you to configure a time schedule to run a select list of SPOT reports and have them delivered via email in PDF format. Delivery can be to single person or a group of people in your organization. Report Queue configuration supports your own schedule based on hourly, daily, weekly and monthly time periods. You also have configuration options on what stores are reported on during the reporting process.